Kinsale, the "Gourmet capital of Ireland." Kinsale is a fantastic destination for your hen party. It is arguably one the most picturesque towns in Cork and dare we say Ireland! It is a very atmospheric place of stunning beauty with no shortage of excellent cafes, restaurants and pubs; and all that a stone's throw away from Cork city. It is the highlight of your pre-wedding planning, the one shining light where you can look forward to having a break from the hassles and stresses of planning your wedding, that’s right it’s the hen weekend or hen party! When you need a break from planning meals, music, dances, clothes venues and all the other stresses of a wedding, a hen weekend in beautiful Kinsale is just what you are looking for! 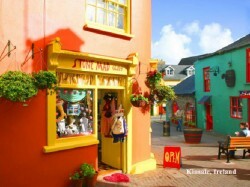 Located west of Cork, Kinsale is a small town located on the coast that is known as the gourmet capital of Ireland. Kinsale offers guests the opportunity to try some of the most fantastic food available throughout Ireland, so if you like excellent food and wine then your biggest problem will be choosing where to eat every night! As a bonus, every year in May, the Rugby 7’s is held in Kinsale, yes that’s right a town full of fit rugby players! Make sure you book early ladies! A hen weekend or hen party gives everyone involved in the wedding a much-needed break from all the stress and planning. It also gives you, your friends and family and members of the bridal party the chance to get to know one another in a friendly, relaxed setting. This is the perfect opportunity to unwind and let yourself be pampered before the big day arrives! Remember that even though a traditional hen weekend or hen party is all about having a few drinks, it should include much more than that. There is still plenty of time for drinking don’t worry! But, you should consider planning some other fantastic group activities where everyone can relax and have fun. Dance classes are the perfect activity for ladies of all ages, learn some of the most popular dances from the last few decades through to famous artist’s routines! Have fun on your next hen weekend, you only have one.